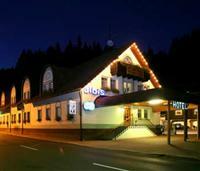 Hotel Albis is situated in the picturesque mountain town of Vrchlabi, Czech Republic, in the midst of the beautiful Krkonose mountains (Giant Mountains). This welcoming ski hotel enjoys a central location for exploring this mountain area. The hotel's amenities and easy access to the ski slopes of the Herlikovice Ski Area, make it an ideal destination for a family vacation in the northern part of the Czech Republic. While the hotel's location is known for great winter sports activities, there are also plenty of attractions for sightseeing. The Krystof Gendorf Castle, Old Town Hall, Augustinian Monastery, and an original Baroque stone bridge, are all within easy reach of Hotel Albis. Hiking, biking, and water sports are popular during the summer months, as are paragliding, and horseback riding. You will feel at home in this atmosphere, where the family restaurant is adorned with a large fireplace, and a snack bar is combined with a game room complete with billiards tables, soccer tables, and a large screen TV, a great place for the family to spend time together and play games after a day of outdoor activities. Enjoy a delicious breakfast at the restaurant, and stay connected with others back home with the wireless Internet access.